Northampton is a small city with a big appetite for the arts. There are a number of murals painted throughout the city. Most are easily seen and people know the history behind some of these murals. Other murals may have been noticed but the story behind them are a mystery. Back in September and October of 1997 three murals were painted by Alex Cook. 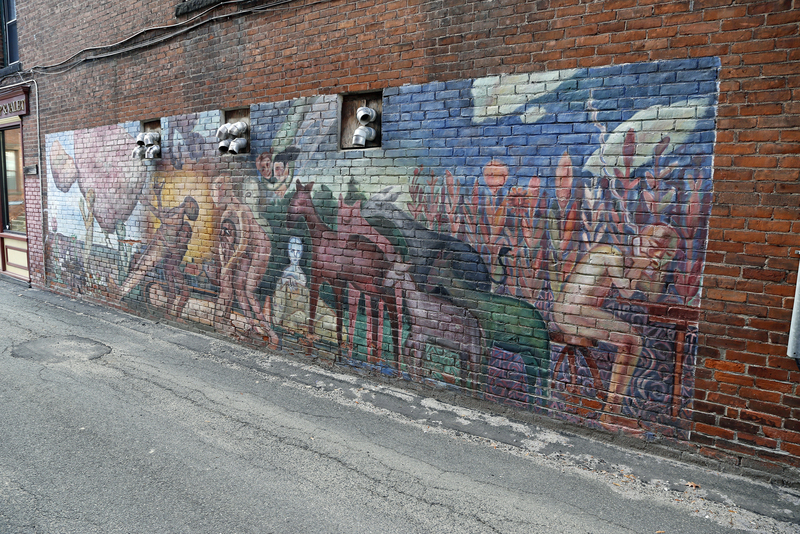 These 3 murals were his final project while working towards his painting degree at UMASS Amherst. Alex was living in Northampton at that time and looking for walls that would be good for a mural. He found one and showed a sketch to the building owner who liked the idea. 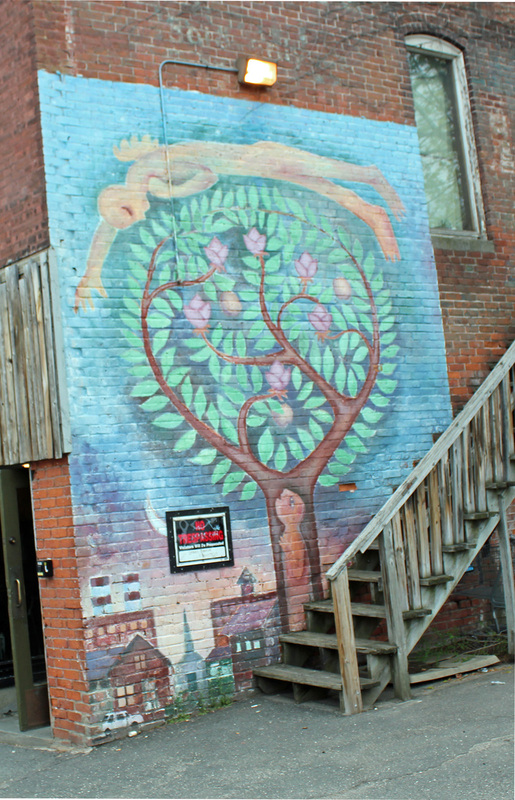 The first mural is at Bridge Street near Market Street on the building wall of the Roost. The image depicts a tree towering over a city. According to Alex it is a representation of the enormity of spiritual life and how it towers over the daily details of mundane living. Since painting this mural Alex has had the opportunity to make murals of that image several more times. It continues to be a powerful image for the artist. The second mural is right across the street. It is smaller and is in an alcove where once existed a working pay phone. 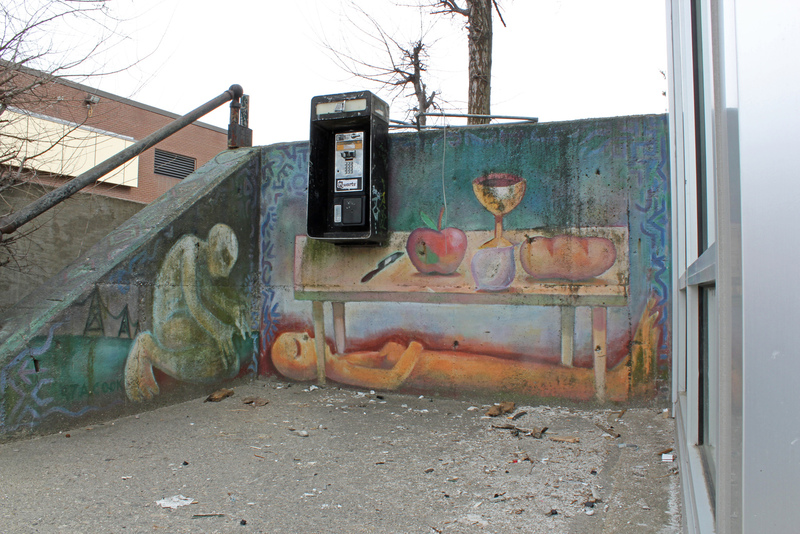 The mural is beneath the remnants of that phone. A reclining figure is on his back, eyes closed and under a table. This image is another spiritual metaphor. Mr. Cook stated that it had come to represent to him the unconscious spiritual longing, the potential for growth, learning etc. This image is meant to describe what Alex feels is often true of us, that we are in close proximity to all that we need (the meal on the table above). Alex continues that perhaps the man is sleeping, happily knowing that the sustenance he needs is right there on the table above him. Maybe the man is fretting away, feeling distant from the good that he needs. In either case, the nourishment is very close, right there for him. The other figure is an angel of sorts, or his friend. Someone there caring for him while he is asleep and potentially vulnerable. The third mural is right around the corner from the Roost on Market Street. It is in the alley of the laundromat. The first mural pleased the building owner so much that he offered this wall without asking to see a sketch of the proposed mural. Alex said this was wonderful because it allowed him to do what he loves most which is to improvise. Alex went to that wall with no idea in mind as to what images would be in the mural. He made it up in a few hours while making the drawing. The mural ended up again being a bunch of metaphors for spiritual things . These images show people helping each other, a man laboring under an enormous weight, another levitating and a guy on the phone to God. These 3 murals are the first Alex Cook ever painted. He says he loves them. Since completing these he has painted over 100 murals around the country. 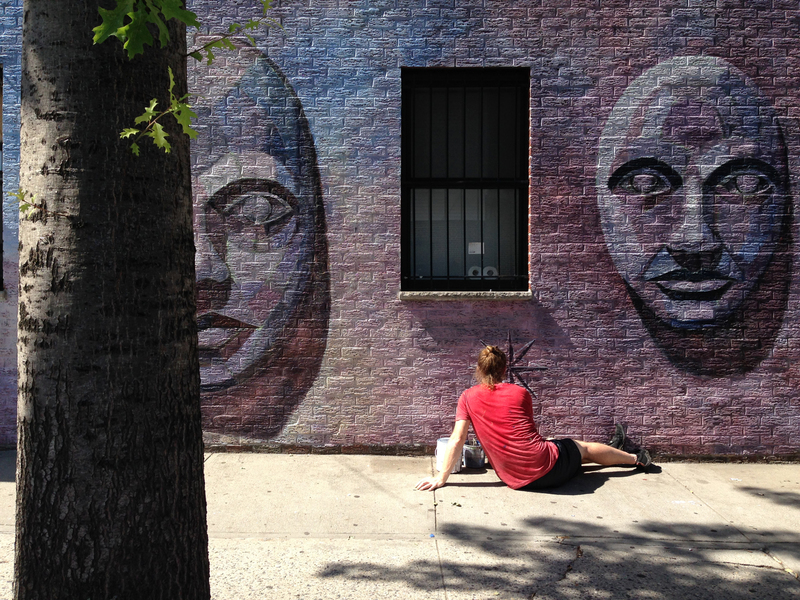 During May and June of 2015, Alex completed a mural in Greenpoint , Brooklyn. He received financial help through an online fundraising campaign. Alex also has a mural in Long Island City, Queens, NY. The artist has also painted murals in Kenya (2006), Nigeria (2010), and Guatemala (2015). 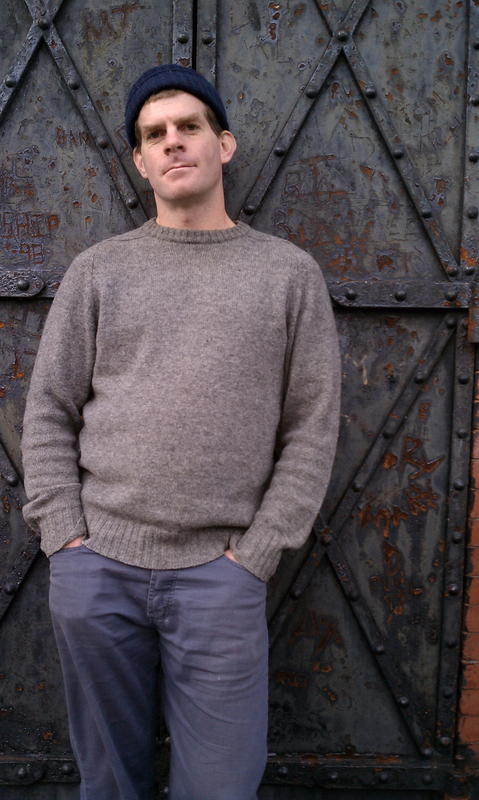 During this Autumn season Alex began living in Port Townsend, Washington. 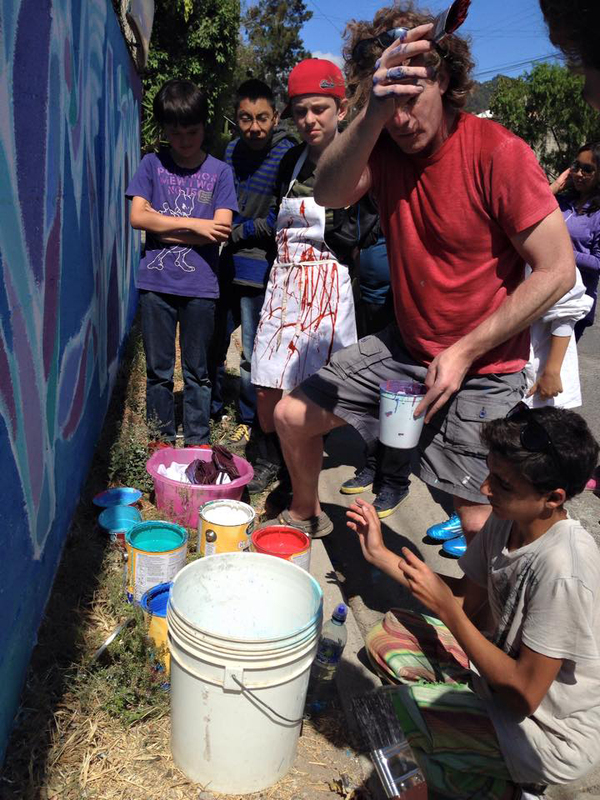 He has painted 3 murals since being out there. Alex is originally from Southern California but basically had been living in Boston for the last 30 years. He lived in Northampton while attending UMASS. Then went to Georgia right after that for 5 years. Alex says he definitely is a Bostonian / New Englander more than anything else.